This post looks better at: http://www.orthodox.net/journal/2009-10-12_iconostasis-design-meeting.html. It is hard to get some graphics right on the blog. Today, Michael Daum (right) our resident point man for the building project, Reader Nicholas Park, and yours truly (Priest Seraphim, the head delegator) met with Fr Michael Storozuk, rector of St Paul the Apostle Orthodox Church Denison TX, met at the building site for a design meeting regarding the iconostasis and altar. Fr Michael is an excellent carpenter, and has built the iconostasis for many churches in the area, including his own, St Seraphim Cathedral, Dallas and many more. The meeting was extremely productive. 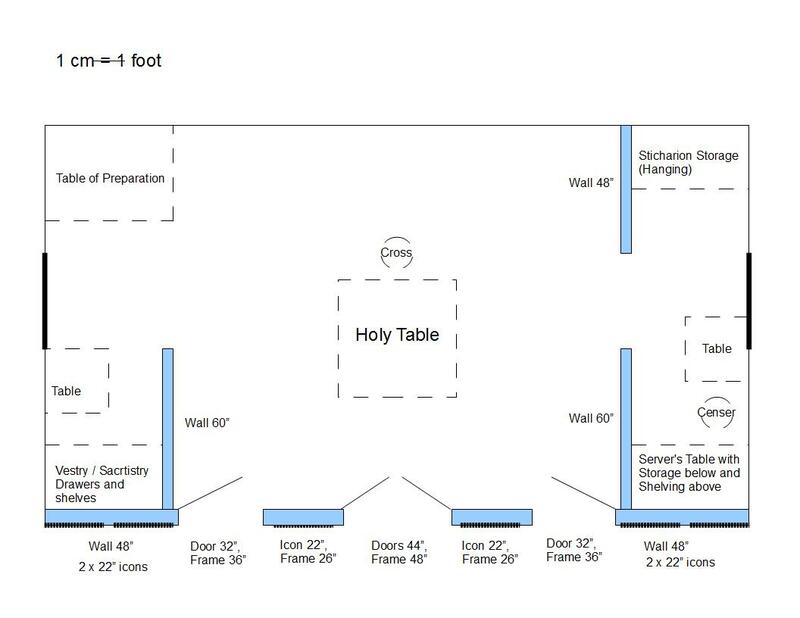 We worked off a provisional sketch Nicholas has made of the interior of the altar, and came up with a basic plan for the iconostasis and inside of the altar. Our carpenters will frame the iconostasis ands interior walls in the altar. After we get the occupancy permit (sometime in December), we will commence work on finishing the iconostasis with nice wood trim and reasonable (read, not expensive) carving, etc. THE EXCITING NEWS is that we plan to have the unfinished iconostasis up before the visit of Bishop Peter for our Feast Day (Dec 6/19, THIS YEAR). The doors will not be hung, but the wall will be there, with arched openings where the 2 deacons’ door and royal doors will be. Things will change, but the basic idea is there. The apse is not shown in this drawing, due to software constraints. I wish to inform our readers that all this design stuff is a leap of faith. The extra things the city has required of us for occupancy have left no funds to finish out the iconostasis. The only reason we are even building the rough iconostasis structure is because of interior design changes which have saved us enough money (from removing interior walls that we had planned on building) to substitute the building of the iconostasis and altar walls. We need as much help as you can give. We are currently trying to raise $40,000 to insure that we can finish the things we need to finish to get occupancy. We have saved as much as we can on construction, and raised about $8000 so far. If you are looking for a “worthy cause”, please see our request for benefactors letter. We are asking for money, like everybody does, but have also made the solemn promise that you and your immediate loved ones will be remembered in the Divine Liturgy in our parish forever, as well as mentioned in our annual benefactor’s day liturgy. Our benefactor diptychs are already over a hundred names. There will be no wall plaque with names on it in our church, but your names will be remembered at least once a week, forever. Nobody reads the names on those fancy plaques this much! This entry was posted on Monday, October 12th, 2009 at 2:50 pm and is filed under Building Project, Pastoral Journal. You can follow any responses to this entry through the RSS 2.0 feed. You can leave a response, or trackback from your own site.